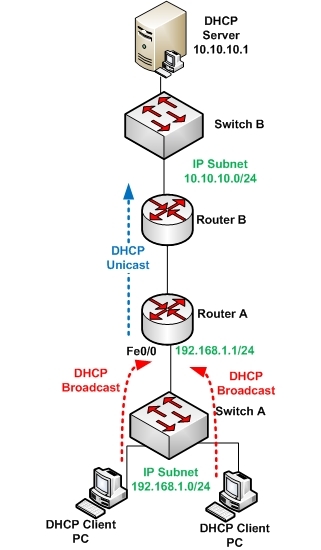 DHCP (Dynamic Host Configuration Protocol) works in a client/server mode. DHCP enables clients on an IP network to obtain or lease IP address or configuration from a DHCP server. This reduces workload when managing a large network. DHCP protocol is described in the RFC 2131. Most modern operating system includes DHCP in their primary settings, these includes windows OS, Novell NetWare, Sun Solaris, Linux and Mac OS. The clients’ requests for addressing configuration from a DHCP network server, the network server manages the assignment of IP addresses and must be obliged to answer to any IP configuration requests from clients. The DHCP sever uses User Datagram Protocol (UTP) as it’s transport protocol to send message to the client on port 68, while the client uses port 67 to send messages to the server. DHCP severs can offer other information, this include, DNS server addresses, WINS server addresses and domain names. In most DHCP servers, administrators are allowed to define clients MAC addresses, which the server automatically assigns same IP, address each time. Most administrators prefer to work with Network server that offers DHCP services. These types of network are scalable and easy to manage. Manual Allocation: The administrator manually assigns a pre-allocated IP address to the client and DHCP only communicates the IP address to the device. Automatic Allocation: DHCP automatically assigns a static IP address permanently to a device, selecting it from a pool of available addresses. There is no lease and the address is permanently assigned to a device. Dynamic Allocation: DHCP automatically dynamically assigns, or leases, an IP address from a pool of addresses for a limited period of time chosen by the server, or the address will be withdrawn when the client tells the DHCP server that it no longer needs the address. DHCP works in a client/server mode and operates like any other client/server relationship. 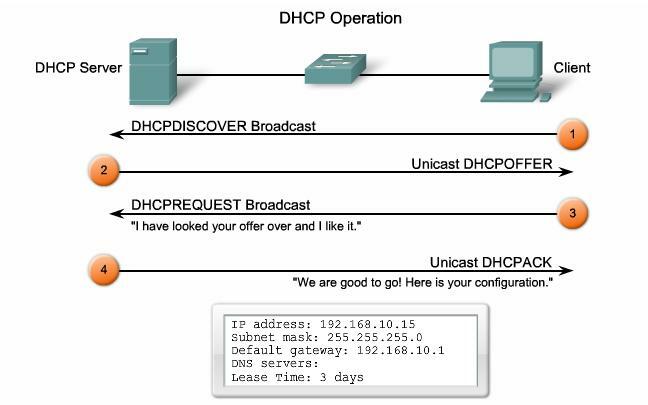 When a PC connects to a DHCP server, the server assigns or leases an IP address to that PC, which enables The PC, connects to the network with that leased IP address until the lease expires. The host must contact the DHCP server intermittently to extend the lease. This lease mechanism ensures that hosts / clients that are mobile or power off do not hold onto addresses that they do not need. These addresses are return back to the pool by the to be reallocated to other clients when needed. DHCP assigns IP addresses and other important network configuration information to clients dynamically. Cisco router uses the Cisco IOS feature known as Easy IP as an optional DHCP server. Easy IP leases IP configurations to network clients for 24 hours by default. We use the topology diagram below as sample network topology. Step1. Configure excluded address(es): These addresses are reserved for network hosts or clients that need Static Addresses, such as servers, routers and printers. These IP addresses are not included in the address pools that are available for assigning to other clients. Step2. Configure the address pool: Define the pool of addresses from which DHCP assigns addresses to clients on the network. in this case (R1) the available addresses are all addresses on the 192.168.30.0 network, except for the range excluded on step 1. Configure address pool on R1: define the address pool, default gateway, and DNS server that are assigned to each client requesting for DHCP IP configuration. More related: Cisco Catalyst 4500 Switch, How to Configure a DHCP Relay on It?